Adelaide Entertainment Centre Theatre, Thu 22 Mar. 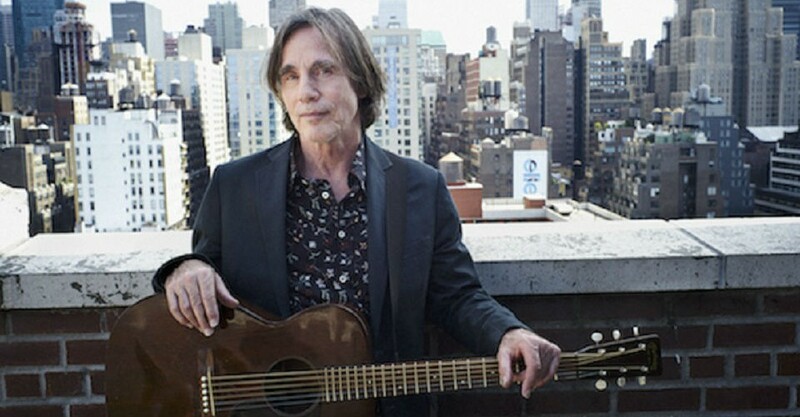 Jackson Browne has returned to Australia for his 7th tour here with a seven-piece band and at age 69 happily appears to have weathered the years well and shows no sign of slowing down. His voice is a strong as ever, and he clearly still loves playing live. He began at the piano for the anthemic Before The Deluge, a plea to take care of the planet which is sadly still quite appropriate and even more necessary today than when it was written in 1974. Browne has consistently aligned himself with environmental causes over the years. His website has a long list of organisations sponsored by his tours, (click HERE for details) and If I Could Be Anywhere addresses the current plight of the ocean. Another song, The Dreamer, was dedicated to the children of Mexican immigrants and was inspired by an organisation that runs programs to enable young Mexicans born in the US to know something of their culture. Latin influences from south of the border have been a regular feature of Browne’s music over the years (eg the gorgeously romantic Linda Paloma), and The Dreamer’s chorus has a lovely Latin lilt. The vocal talents of two young women that Browne has known since he worked with their high school choir, Chavonne Stewart and Anthea Mills, were front and centre here, and they provided delicious vocal embellishments throughout the night. One shouldn’t get the impression however that these songs for causes make for a gloomy concert – far from it. Browne has always had the ability to wrap such issues into soulful melodies and poetic lyrics that inspire rather than depress. The first set concluded with a song he said many people think of as an Eagles cover, and after years of trying to convince people he co-wrote it with recently deceased Eagle Glenn Frey, he now just finds it easier to concede that it is indeed an Eagles cover song! So Take It Easy sent us all skipping out to interval happy to know there was plenty more to come. The second set was noticeably more upbeat. A singer songwriter he may be, but Browne’s back catalogue has a healthy dose of rock songs, and it was here that his talented band really flourished. Jackson is an inclusive player and loves giving his band musical license to go for it – the duelling guitar arrangements between Val McCallum (lead) and Greg Leisz on lap and pedal steel guitars were exhilarating. Tuneful, country flavoured guitar solos have always been part of Browne’s arrangements and give them that unmistakable stamp of the West Coast sound that stormed popular music charts from the early ‘70s. Browne himself though has had few commercial successes that earn mass appeal. The one exception was The Pretender, and the version we heard showed off more magnificent singing from Chavonne Stewart and Anthea Mills. Years ago Browne was a huge supporter of Warren Zevon. He eventually produced some of Zevon’s biggest hits. Zevon died in 2003 but Jackson is still promoting his work posthumously. There were clearly several in the audience who wanted to hear a Zevon tune or two and were treated to Carmelita, and Lawyers, Guns And Money. However, I have seen Zevon play the latter live, and it couldn’t quite match the punch or the power that Zevon delivered. For A Dancer, one of the best songs ever written, had Browne back at the piano, and once again allowed us to enjoy the exploits of his guitarists. Stay had the audience all singing along, and at one point got very bluesy with the three Afro-Americans in the band leading the singing. As it is with many of these aging rock stars, this was a night to cherish. Who knows if Browne will be back again? Everyone went away happy – we got plenty of his old standards, a sprinkling of newer songs, and superb musicianship from his band. Jackson has a far more commanding presence when playing the piano, but spent most of the night playing an impressive set of ever changing guitars. On guitar he just sets the chord or riff pattern, and then retreats to a space that lets his band do their work, coming forward now and again to anchor the song with his wistful flowing turns of melody. He willingly shares his musical soul with us and his band, and we all feel better for it.